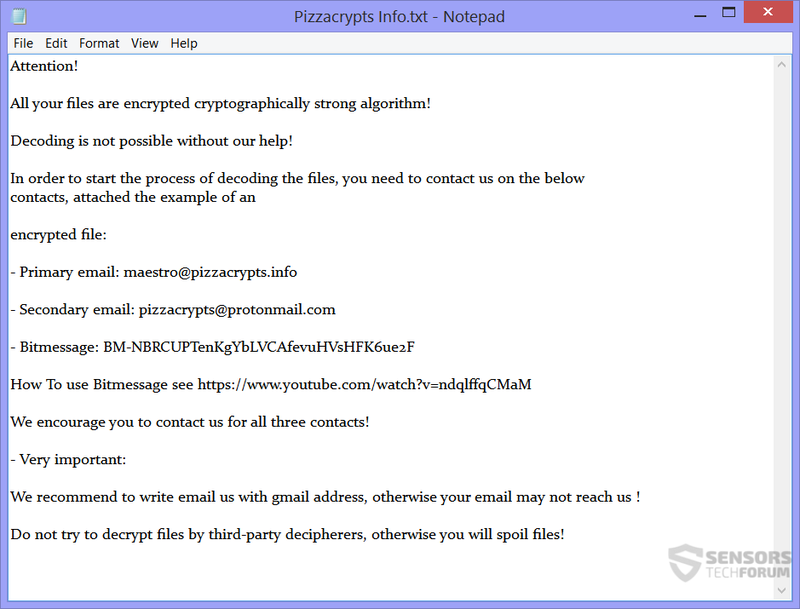 PizzaCrypts is the name of a ransomware virus, which uses the Neutrino exploit kit as the primary distribution method. It encrypts files and wants Bitcoin currency as a ransom payment. The extension this ransomware appends to all encrypted files is .id-[id number][email protected] To remove the ransomware and see how to restore your files, you should read the article till the end. Short Description The ransomware will encrypt all of your files and show a ransom note, giving out contact emails to be used for communication about the ransom payment. Symptoms The ransomware asks for Bitcoins after encryption and puts.id-[id number][email protected] as the extension to each file. 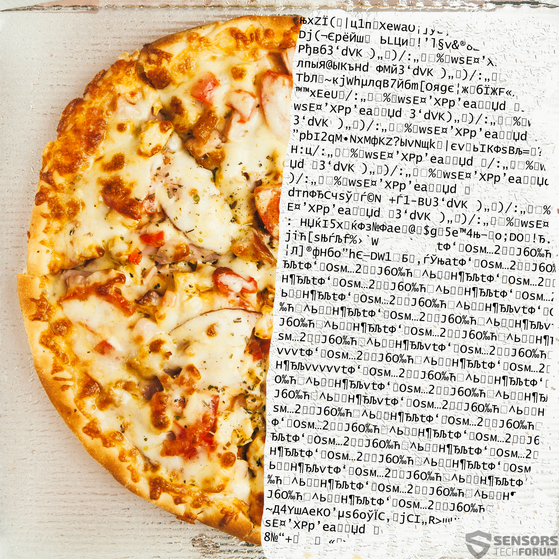 User Experience Join Our Forum to Discuss PizzaCrypts. PizzaCrypts ransomware is mainly infecting computers through the Neutrino Exploit Kit and possibly some others. The exploit kit usually seeks for older versions of Flash and exploits their vulnerabilities to deliver the payload of the ransomware. PizzaCrypts might also be spread with spam emails. Emails like that often have some files attached inside. Opening the attachment will trigger the malicious code to infect your computer. Another possibility of a user getting his PC infected could be through social media or file sharing networks. Malicious files might be lurking there as well if the ransomware creators or other criminals have put them there. Avoiding that possibility for infection is doable if you are very careful with what you do on the Internet. PizzaCrypts is a new ransomware that a researcher called Brad has found recently. The ransomware is named after a part of the extension it places on encrypted files, which is also one of the emails given for contact. The registry key will enable the ransomware to start at the same time the Windows operating system starts. All your files are encrypted cryptographically strong algorithm! Decoding is not possible without our help! We recommend to write email us with gmail address, otherwise your email may not reach us ! Do not try to decrypt files by third-party decipherers, otherwise you will spoil files! From the ransom note, it becomes apparent that the ransomware creators want you to contact them in all three ways they have given and to use a Google mail address. Probably they might delete some of the contact details to cover their tracks, and the emails they use might have block filters for other mail services. The amount you have to pay for file decryption is not stated. Do not pay the ransom as no guarantee could exist that you will get your data back if you do so. Although the ransom note states that tampering with your files might damage them – this might just be an empty threat. Read on, to find out how you might recover some of your files. After the completion of the encrypting process, files on your computer machine will have another extension appended to them – .id-[id number][email protected]. PizzaCrypts ransomware is not reported to delete Shadow Volume Copies from the Windows operating system. Read the article to the end to see how you can try restoring your files. If your computer system is infected with the PizzaCrypts ransomware, you should have some experience in removing malware. You should get rid of this ransomware as fast as you can before it encrypts more files and distributes further on the network you use. The recommended action for you to take is to remove the ransomware effectively by following the step-by-step instructions manual provided down below. Threats such as PizzaCrypts may be persistent. They tend to re-appear if not fully deleted. A malware removal tool like Combo Cleaner will help you to remove malicious programs, saving you the time and the struggle of tracking down numerous malicious files. Threats such as PizzaCrypts may be persistent on your system. They tend to re-appear if not fully deleted. A malware removal tool like SpyHunter will help you to remove malicious programs, saving you the time and the struggle of tracking down numerous malicious files. Note! Your computer system may be affected by PizzaCrypts and other threats. SpyHunter is a powerful malware removal tool designed to help users with in-depth system security analysis, detection and removal of threats such as PizzaCrypts. 1. Install SpyHunter to scan for PizzaCrypts and remove them. 2. Scan with SpyHunter, Detect and Remove PizzaCrypts. Ransomware infections and PizzaCrypts aim to encrypt your files using an encryption algorithm which may be very difficult to decrypt. This is why we have suggested several alternative methods that may help you go around direct decryption and try to restore your files. Bear in mind that these methods may not be 100% effective but may also help you a little or a lot in different situations. Note! Your computer system may be affected by PizzaCrypts or other threats. Remove PizzaCrypts by cleaning your Browser and Registry. Fix registry entries created by PizzaCrypts on your PC. Combo Cleaner is a powerful malware removal tool designed to help users with in-depth system security analysis, detection and removal of threats such as PizzaCrypts. Step 5: In the Applications menu, look for any suspicious app or an app with a name, similar or identical to PizzaCrypts. If you find it, right-click on the app and select “Move to Trash”. Step 6: Select Accounts, after which click on the Login Items preference. Your Mac will then show you a list of items that start automatically when you log in. Look for any suspicious apps identical or similar to PizzaCrypts. Check the app you want to stop from running automatically and then select on the Minus (“–“) icon to hide it. Remove PizzaCrypts – related extensions from your Mac’s browsers. A pop-up window will appear asking for confirmation to uninstall the extension. Select ‘Uninstall’ again, and the PizzaCrypts will be removed. When you are facing problems on your Mac as a result of unwanted scripts and programs such as PizzaCrypts, the recommended way of eliminating the threat is by using an anti-malware program. Combo Cleaner offers advanced security features along with other modules that will improve your Mac’s security and protect it in the future. Hey !, I found this information for you: "Remove PizzaCrypts Ransomware and Restore Encrypted Files". Here is the website link: https://sensorstechforum.com/remove-pizzacrypts-ransomware-restore-encrypted-files/. Thank you.